Totem poles were raised by various tribes of indians in the evergreen rain forests of the Pacific Northwest, Canada and Alaska to honor important individuals. These hunter - gatherer tribes were composed of seven distinct tribes with a number of different dialects who tried to live in harmony with the many natural animals and forces which they encountered in an interconnectedness way of all life. Wealth and prestige were associated with family linkage and intermarriage often occured to cement familial bonds. Totem poles were raised to celebrate important births, marriages, deaths, property transferences, new house, new chief etc. These totem poles were elaborately carved from huge trees and were brightly painted. Spoon manufacturers were quick to pick up on the things that tourists were likely to see, and we find a number of different totem poles depicted on spoons. In some cases the spoons fairly accurately portrayed certain totem poles and in other cases they simply depicted generic images of totem poles or parts of totem poles. On my recent visit to the Tongass Historical Museum in Ketchikan, Alaska, the Senior curator, Richard H. Van Cleave helped me identify some of these spoons and inspired me to redo this entire exhibit. As usual we find many different shapes and styles of spoons. 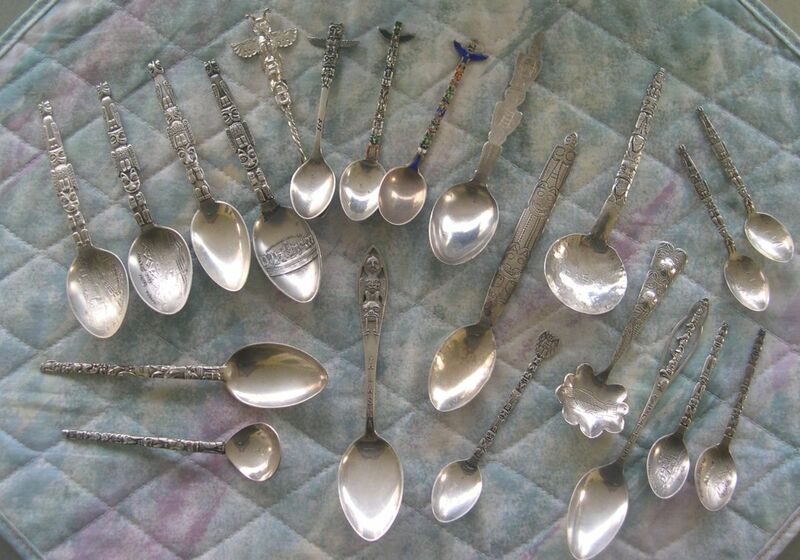 Some of these spoons were manufactured by established silver companies and in some cases they were handmade by local silversmiths. All the silver company spoons are sterling. The hand made spoons were usually made from silver quarters, half dollars or silver dollars and are most likely 900 silver. 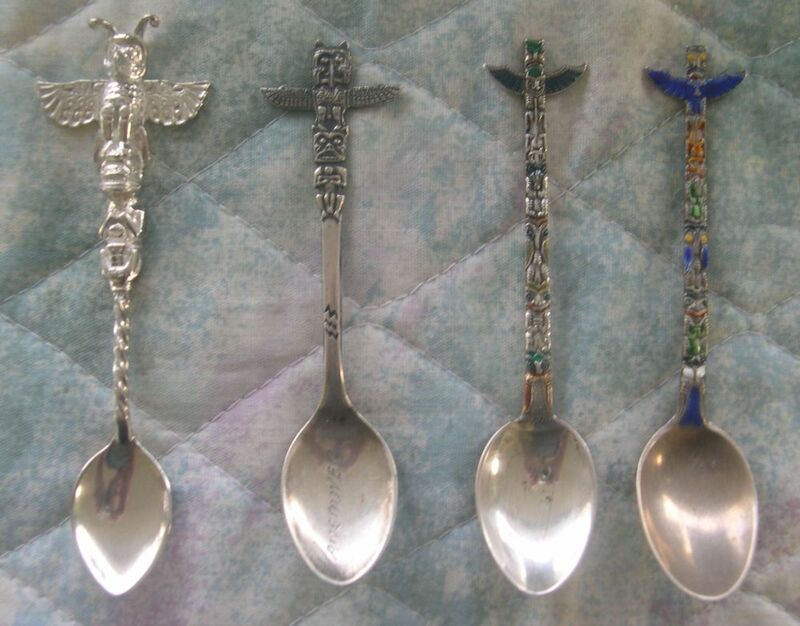 In some cases, the spoons were sold in distant places and were then customized for that particular area..
left: 1. customized with a city scene and labeled Seattle. 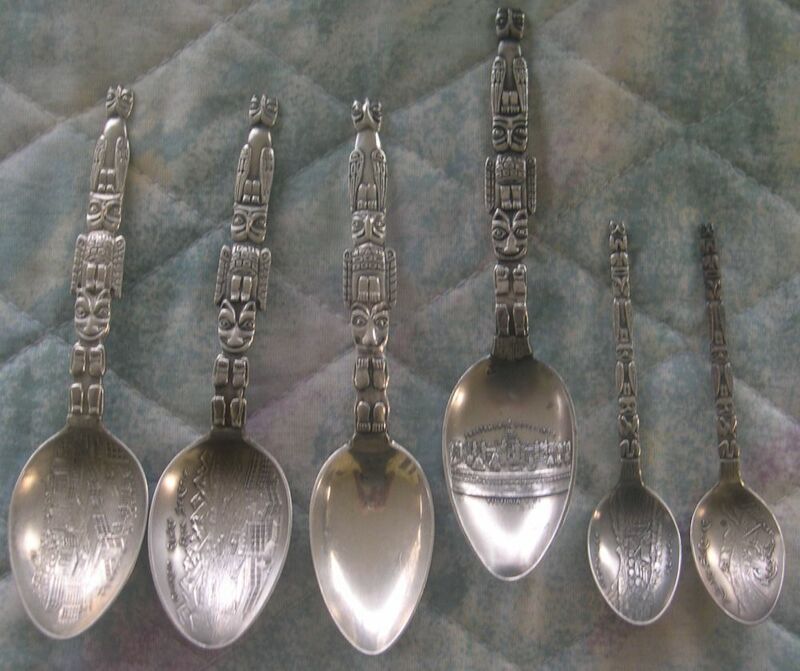 2. customized with a building and mountain scene and labeled "Olympia Range from Seattle"
The two demi spoons on the right both show the same totem pole (not identified). left: 1. Cast spoon (probably modern) and labeled as "Thunderbird totem, Alaska sterling by Houston"
3. partial enameling on stem no customization in bowl, back marked "Alaska Totem Pole"
4. partial enameling on stem in different colors -- back marked "Alaska Totem Pole"
interesting hand made spoon with unusual bowl showing an engraved salmon , The back is engraved "Sitka 189"
unidentified pole. spoon marked 'sterling' with no other identification.